There are two conflicting world views in everyone. The world view from nature and the man made one. A young school kid in northern Michigan is running home from school in a cold rain. She’s drenched and running alone, carrying a backpack that doesn’t seem to bother her any more than the cold rain. I watch her as she runs past me. We’re the only ones not counting the wild animals out in this soup. She’s smiling like she doesn’t care about the weather. The weather is her friend. It’s her blood. Apologies to Elmore Leonard, but she’s not from Detroit. 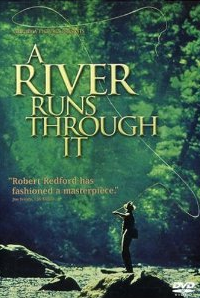 Norman Maclean’s A River Runs Through It is more her world view. Her day, her life, begins with the weather. Mother Nature is in her blood and she’s learning at a young age to use it to make her way in the world. Nature is taming her, not man. Not yet. Her mother can change a car engine, repair the roof, shoot deer, fish better than Norman Maclean, and handle the toughest news with strength of an oak tree. Her mother’s computer skills are only so so, although she is on Facebook. They heard an IBM salesman moved into the all year round cabin on the lake. He plans to fix it up, maybe with her mother’s help, and work out of the cabin as a home office. Her father owns a convenience store that gets by on selling beer and worms. She helps out but is becoming resentful that she’ll be stuck there for the rest of her life. She doesn’t expect IBM to value job experience selling worms. Most of the other neighbors are retired automotive people and teachers with long summer vacations. 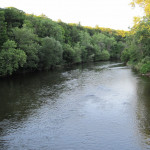 She’s getting rebellious, like the cranky weather, like Norman Maclean’s brother in A River Runs Through It. Her older brother is killed fighting terrorists, his body broken, not his spirit. Home in the suburbs and stuck behind a school bus in the morning. All the flashing lights are going off as a young boy with his father beside him waits for his ride to school. The school bus door opens and the father hugs his son and watches him get in the bus. No more than a quarter of a mile and the school bus turns into the school parking lot, stops, and the door opens for the kids. The school’s a few hundred yards down the road but none of the kids make a break for it. Instead, they obediently wait for their rides, trained in a well run suburb to know their place. Tamed by man, they will undoubtedly excel in school. The apple doesn’t fall far from the tree and these kids have parents who can master the new roundabouts in busy suburban traffic areas with only a few tries. Standardized tests are aced. They know what to expect. They submit to the rules with high expectations of societal rewards. If caught in a burning building aflame from a terror attack, these MBA grads will stay put as ordered and tweet away their last moments on earth that the floor is too hot. A fireman from a working class neighborhood will swear at them that the whole building is too damn hot.